"Spatial Organization of the Ccq1-Tpz1-Poz1 Telomere Complex​"
I have been attending MSNO meetings for the past four years. The MSNO has been crucial in providing me a platform to disseminate my work to other members of the scientific community in the region. At these meetings, I often receive feedback regarding the current state of my work as well as possibilities for expanding my work in the future. I have presented posters and platform presentations at these meetings and it has always been a positive experience. It was because of these experiences that I decided to become a member in 2016. That year I presented a platform presentation about my work and won an award which covered $500 of my travel expenses to attend the 2017 national M&M (Microscopy and Microanalysis) meeting in St. Louis. This was my first time attending a national conference and in the beginning I felt quite overwhelmed. The conference largely focused on current work in the physical and biological sciences. Going through the program I remember having difficulty deciding on which talks to attend because there were so many I was interested in. The meeting offered tutorials on many microscopy-related topics and featured several distinguished speakers whose work I found fascinating. Every morning there was an accomplished speaker that started the day with a lecture about the advancements in their field. These talks were highly motivating and highlighted amazing developments that led to groundbreaking discoveries. The meeting also featured a number of student-related events which included parties and other social gatherings. At the “meal with a mentor” gathering, I met numerous members of the microscopy community who were still in the process of doing their doctoral research. These members belonged to both the physical and biological sciences. 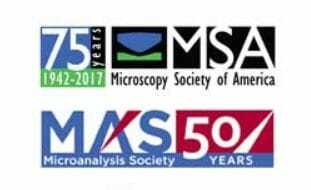 The mentors were all senior members of the Microscopy Society of America (MSA) and told about their path into their current positions. I personally met with a senior scientist at the NIH whose research focus was largely in-line with my own and he provided me with useful information to help with the next steps of my career. At a separate student social, I met many other students and had a chance to talk to the current MSA president along with other senior members. Another party, hosted by FEI, took place at Busch Stadium, and I was able to meet with other scientists in a less formal setting. I was lucky enough to be chosen to give a platform presentation at M&M 2017. This was the first opportunity I had been given to present my work to an international audience. The audience consisted of many of the leading scientists working on the same type of analysis that I focus on in my doctoral research. I received a lot of useful feedback regarding my work and met some people afterward that I expect to keep in touch with. I was even able to meet with the developer of the type of analysis that I do, and was able to have a detailed discussion of the various aspects of the analysis. Overall, the MSNO meetings have been an amazing place to hear about current research and present my own work. The opportunities that it provides to become more involved with the scientific community of the region has been outstanding. The award to attend a national meeting only extends the number of opportunities available by opening the door to a much larger community of scientists that are all willing to help students achieve their dream of becoming a scientist.